Morten Harket (49) has just returned from the world’s largest refugee camp. Where he probably saved the life of a small boy. – As a father I can feel all the alarms going off in my body when I’m witnessing so many children in need. It’s despairing to feel so helpless, I just feel like taking all the children with me home, says Morten Harket, who became a father for the fifth time in September. Together with the Norwegian Refugee Council he visited the refugee camps of Dadaab in Kenya. Where 250.000 people are living in three gigantic camps. Dagbladet meets Morten Harket and actress Line Verndal in the offices of the Norwegian Refugee Council in Oslo. They will both take part in TV2’s artist gala, which on December 13th will raise money for refugee children. They have both visited disaster areas to see the conditions up close. Verndal was in Georgia to visit some of the thousands of refugees from South Ossetia, Harket was in Dadaab in Kenya, where 97 percent of the refugees are Somali, and more than half of them have lived there since the 1990s, when the war in Somalia started. – It’s easy saying yes to work like this. After all, you could say we have a statutory obligation to help people in need, and then I’m not able to say no. We’re talking about helping people who have lost all they had. 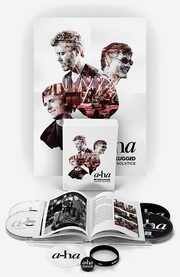 They have nothing, Morten Harket says. Both he and actress Line Verndal are parents of small children and they say that meeting the children made a big impression on them. – We visited a hut where a small boy, around two years old, was standing on the floor crying. He had some white, almost mouldy, growth on his legs. It turned out to be burn injuries that he had gotten when he ran towards a pot of food. In his eagerness to satisfy his hunger, he got covered by the boiling water in the pot. No one had treated his wounds. It was impossible for me to leave without helping him. I got hold of a doctor who was travelling with us. By simple means and medicines he was able to provide the boy with necessary treatment. That probably saved his life. In the meantime, outside the tent, a long line of people who also needed medical attention started to form. – There must have been 350 people standing in line. I was struck by an overwhelming feeling of helplessness. It’s horrible not being able to help everyone, when you see how little is needed, Harket says. He has done a lot of charity work before, but it’s the first time he’s working for the Norwegian Refugee Council. Both he and Line Verndal feel it’s a privilege being able to use their celebrity status for something that really matters. – Those who say that it’s problematic to engage celebrities to make people donate money for refugee children, should think again one more time. It’s harder to defend not taking part in this, Morten Harket says. – Being a celebrity is of absolutely no importance. We have to use the energy we are given, and then there’s nothing better than being able to reach through to others, Harket and Verndal say. In the camp and the surrounding areas where Morten Harket stayed, there was a constant danger of kidnappings. That’s why he needed to be protected by bodyguards 24/7. – No one has to find out beforehand that you’re coming. The fact that I’m white automatically puts a price on my head, and puts me in danger of being kidnapped, Harket says. One of Harket’s bodyguards in Kenya experienced a friend being killed. That was the day before Harket arrived. – It’s clear that those dangers prevented me from moving around freely and doing everything I wanted to do. But I’m used to bodyguards and you just have to adapt to the situation, he says. 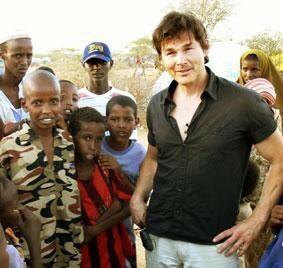 A film producer who went along to document the journey wanted to bring Harket with him into Ethiopia. – I really wanted to go. But sometimes you have to realize that it’s just not posssible. It’s extremely dangerous to go there, Harket says.